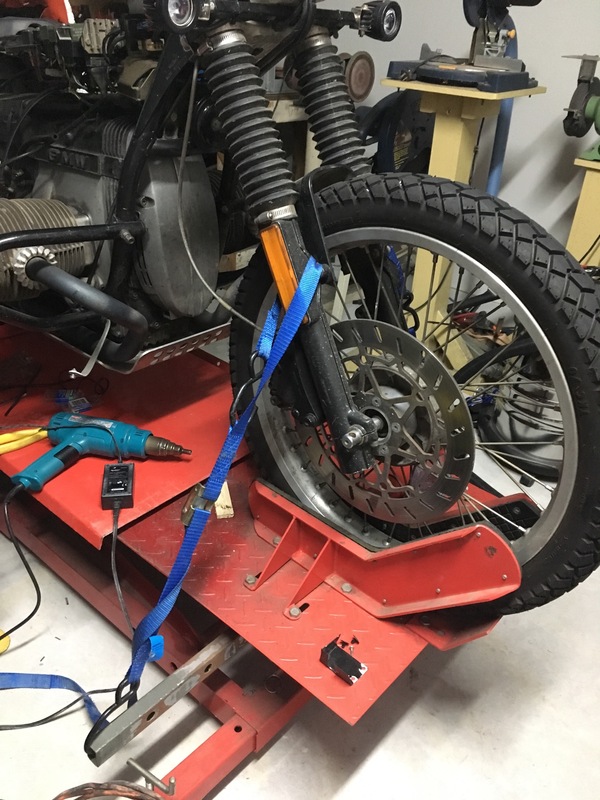 As the title says, where is the best point to tie down a K100RS on a bike lift. With the front fairing on there seems to be no real point on the forks, can't get to the triple clamps, can't get to the bars. I don't want to rely on the front wheel clamps as I'll be lifting the back to remove everything for clutch spline lube and rear main seal replacement. It almost looks like there should be something that clamps on the stanchions to attach tie downs too??? Use a support under the engine and a long tie-down from one side of the lift to the other around the frame just by the fusebox. Or rig up a sawhorse affair to be placed under the tail frame once the backend comes off. Also use an under-engine support. 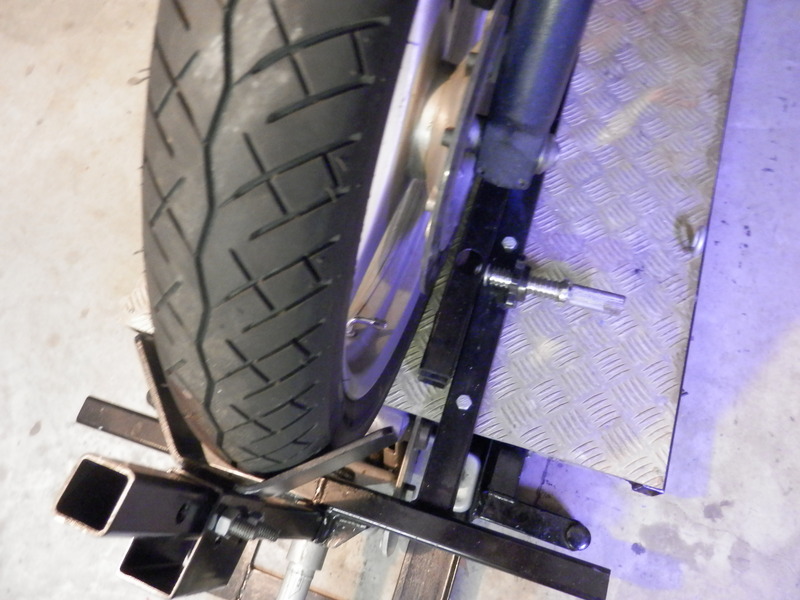 You can use your tie downs to anchor the fork sliders as I am doing at the moment with my airhead. This was necessary as I was removing the bars and headlight and needed the area around the steering head free. On the K you might have to remove the front guard if you can't get a webbing strap down between the guard and the top of the slider so that the strap pulls against the guard mounting bolts. 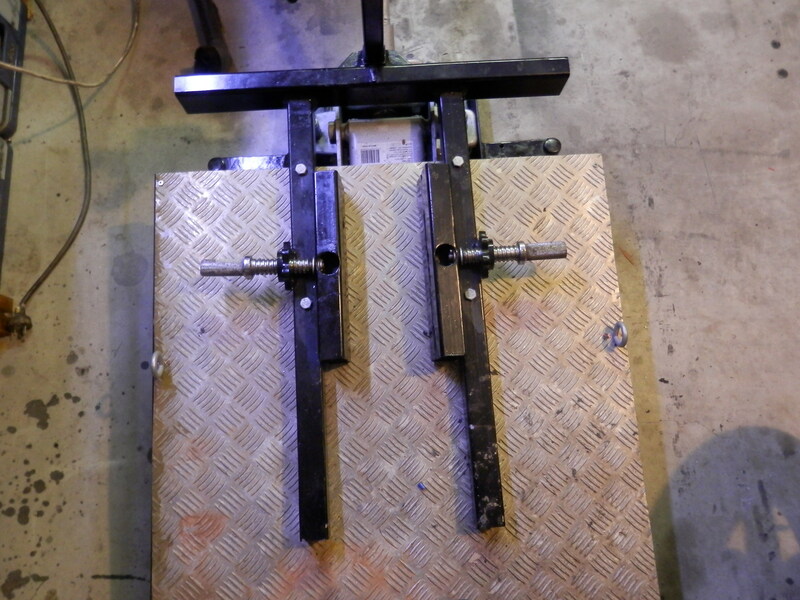 You will see that on my lift I have added a wider bar across under the tray so my tie downs get a more positive angle. 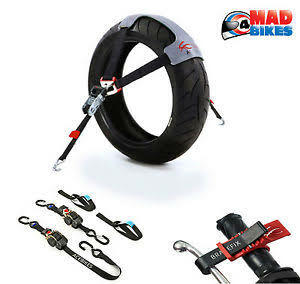 I also have a tie down harness that mounts over the tyre (or tire) and can be used on the front or rear wheel. I have grabbed a picture off the internet of a similar device - you'll get the idea. I can't get up to the lower triple clamp as I have the rubbers in place that seal the hole. Looked at attaching to the fork sliders, but, it is either above the guard in which case it is only the guard stopping the webbing from sliding down. And if I go lower onto the brake caliper the angle is very small. I like the look of the tyre tie down. Removing the front mudguard helps. However with my front wheel clamped and tie down straps located off the frame under the side covers, which need to be removed my bike is rock solid. 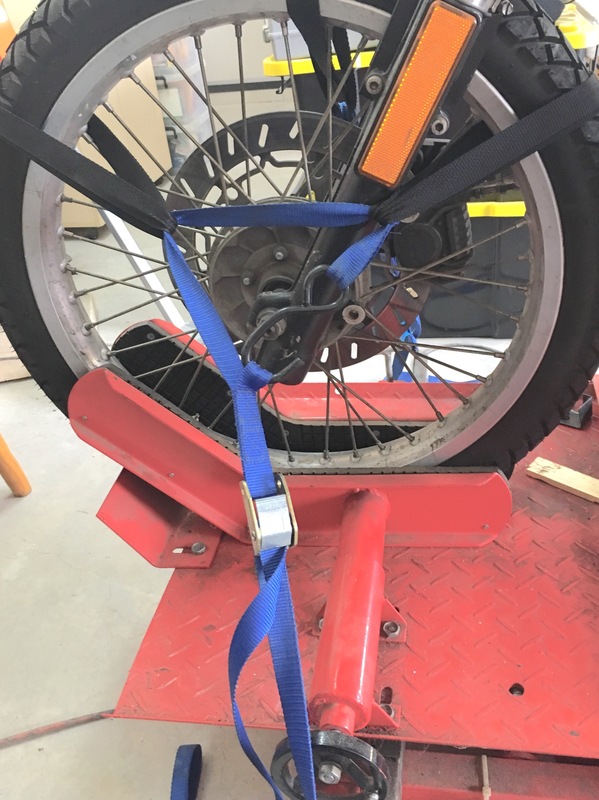 That is what I have done at present with the bike on two wheels, but, once I block up under the engine I am concerned the front wheel is going to "pop" out of the wheel clamp if there is nothing holding it down. Tesla, I did a little experiment when messing around in the garage this morning. Using the idea of the commercial tyre type tie down I used a couple of short webbing straps passed through the rim and over the tyre at 10 & 2 o'clock then passed a tie down strap through them to create a triangle down to your securing point. You could use short loops of rope to achieve the same. It was nice and secure. I initially tried just a single loop around the rim and tyre at the top of the wheel as you can see on the other side of the bike but it was not so good. If you do the triangle thing on each side I'm sure it would work for you. Good luck. It shouldn't be too hard to make something up so that you can strap the front wheel.